All the colors of the world of gymnastics will perform at the Festival del Sole: from 29 June to 4 July almost 4,800 non-professional athletes are going to “invade” the city of Riccione: five arenas and an athlete’s village for showing a passion without barriers and age. Sunday, June 29 in Piazzale Roma the Opening Ceremony with a Grand Parade of all international delegations will start at 21:00. The Grand Closing ceremony, on Friday, July 4 in Piazzale Roma, has been included in the program of the Notte Rosa, together with the famous dancers Raffaele Paganini and Annarosa Petri. Love for the sport, desire to meet with other fans and perform in front of an huge audience to amuse it: these simple ingredients multiplied by 4,800 athletes of all ages and from all over the world will enliven Riccione from June 29 to July 4. That is the choreographic recipe of the Festival del Sole, the largest biennial gymnastics event (and all its acrobatic forms) that opens its 12th edition this year. The Festival will confirm itself as the largest international gymnastics exhibition in the Mediterranean area, polarizing not only the passion of athletes from around the world—from South Korea to Europe, passing through Israel—but also the commitment of UNICEF, Coni, FISAC, Uisp, European Gym Festivals Council, Riviera Green Passion, all patroning the event together with the Emilia Romagna Region, the Province of Rimini and the Municipality of Riccione. 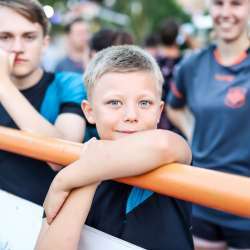 In addition to istitutional patrons, several federal and amateur sports organizations, schools of dance and gymnastics, will be engaged in a series of events that anticipate and conclude the Festival. 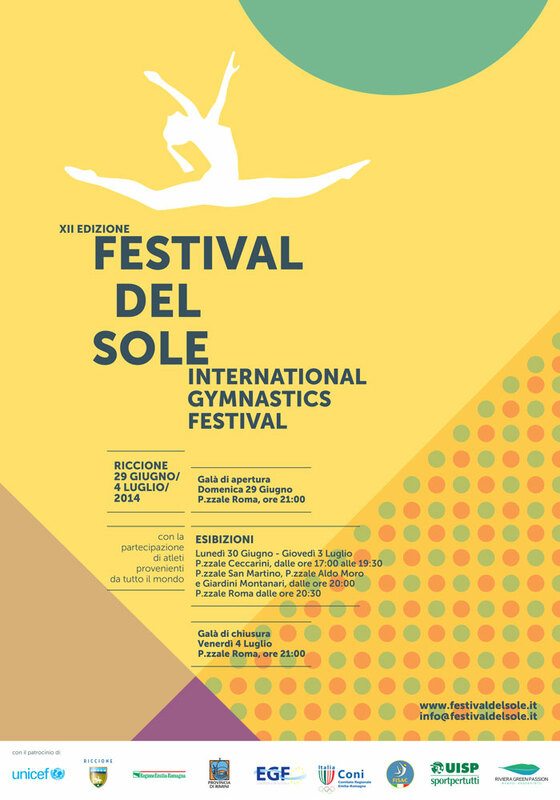 The prologue of the Festival del Sole is assigned to the national league “Le Ginnastiche” fromthe Italian Union of Sport for All (UISP): on Saturday 28 and Sunday, June 29 will take place the semi-final and final phase of the B-SIDE_Experience gymnastic, in Arena Ceccarini. Just in time for the Grand Opening Parade of the Festival del Sole, scheduled for Sunday, June 29th at 21:00: a choreographed parade involving athletes from around the world will testify the values of sport greeting the hospitable city of Riccione, finally flowing into Piazzale Roma for the opening ceremony. That will be the great “start the dance”: from that moment on five arenas in as many squares close to the beaches of Riccione will host a series of performances, free of charge, for a total of about 150 hours, in addition to training sessions during the day. Floor exercises and aerobics, acrogym and acrobatics, rhythmic and artistic gymnastic, classical and modern dance, hip-hop and funky; these are only a few forms of gymnastics and dances taking place at the Festival del Sole, where there are no limits regarding age or technical levels. And on July 4, for the traditional Closing Ceremony, the event will ideally bring together the Festival del Sole with the spirit of the Notte Rosa: the Welldance perfomance of professional dancer Annarosa Petri and international etoile Raffaele Paganini, the discipline they invented and presented to the public through an official trial on Big Brother 13. On the central stage in Piazzale Roma they will engage the public in an open workout of the new method for getting in shape by dancing. The big news of this edition will be the Festival Village, which will be located within “Papa Giovanni Paolo II” park, in the city center in front of the station. In the shade of the park athletes can rest or take part in several workshops of dance and gymnastics that will take place there. In addition to that the athletes will find food stalls, free WiFi and, of course, the desks of the Festival del Sole and Firma Eventi. The friends from Blume Gran Canaria and World Gymnaestrada Helsinki will also be present to promote their events. Firma Eventi by Egocentro, HERA, GEAT, Start Romagna. Aquafan, Oltremare, Acquario di Cattolica, Perle d’Acqua, Flaminia Bevande, Go&Fun Green Energy Drink, Canasta, Ranch Saloon & L’Isola, La Serra, Dolce Bio, Fotospeed, Universum Klub Palestre, Leopard, Assicurazioni Generali, Elettromeccanica Muccioli Marco, Inoltre - Internet oltre i confini.